Kick the habit in 2017 – your life will be richer for it! You know the health risks of smoking but that hasn’t stopped you. In fact, you’ve been thinking and even talking about quitting for years. Well don’t feel guilty. You’re definitely not alone. Nicotine is powerful stuff. 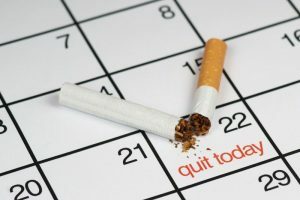 Many people try to quit smoking several times before they kick the habit for good. At Calgary Laserworks we use a low level laser (cold laser) instead of needles to target key energy points on the body. These points are found around the ears, nose, hand and wrist, and when stimulated endorphins – the body’s natural feel-good hormones – are released. This endorphin release has a calming, relaxing effect on the body which helps to reduce or eliminate nicotine cravings and the desire for cigarettes, as well as withdrawal symptoms. In addition to stimulating an endorphin release, the laser stimulates the body’s natural ability to detoxify the nicotine, helping you through the nicotine withdrawal more quickly. Low level laser treatments are a safe, non-invasive, pain-free, drug-free and highly effective solution that will help you quit smoking for good. Don’t doubt yourself – set a date to quit in 2017 – you CAN do it! Call Calgary Laserworks at 403-301-3730 today.